Being that I was a (food) marketing major in college, I know how important branding is to a business. So I am working on getting my branding straight for my business and I’m stuck. I can’t come up with a logo! I want something cute and whimsical (I think! ), but I’m having trouble thinking of something. I started to look at other scrapbooking and card makers’ logos, but nothing is catching my eye. Does anyone have any suggestions? I am really into zebra lately – I was even toying with the idea of making a zebra banner for my show. I really want to order a stamp that I can use on the back of all the items I make, but without a logo, I am stuck. Suggestions are welcome!! Posted in ideas, scrapbook tips, stamps and tagged branding, company logo, stamps, zebra. Bookmark the permalink. 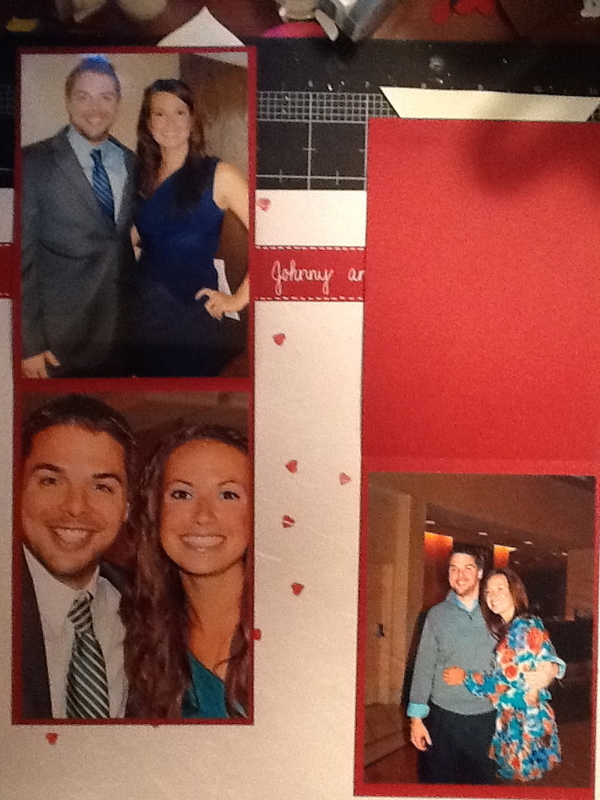 I just spent the past couple hours scrapbooking. 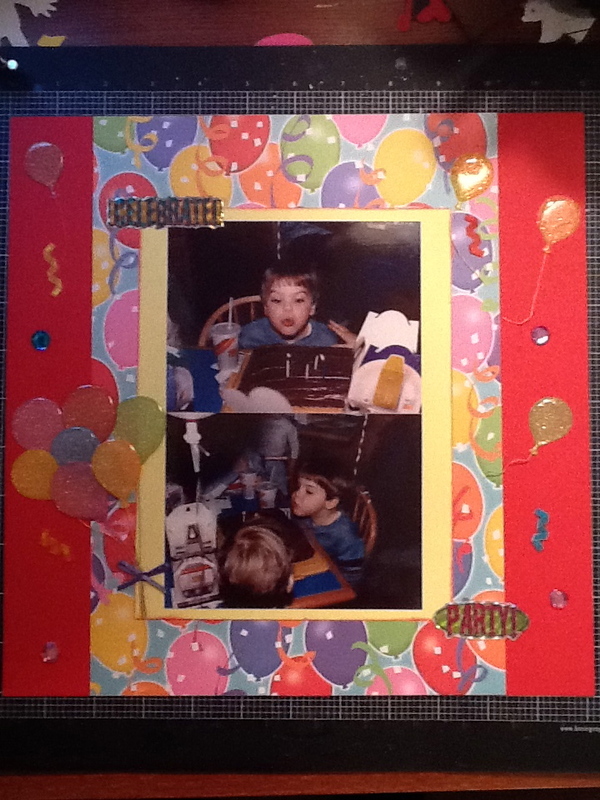 And while it wasn’t me that was actually doing the scrapbooking, I had such a great time. One of my best friends from high school recently finished her basement and had sectioned off part of the basement for a craft room. Since she is the queen of organization (and if you don’t believe me, check out her blog – http://theperpetualplanner.wordpress.com/), I wanted to get some tips on how to better organize my scrap room. She wanted to get tips on new scrapbooking ideas, so we decided a wine and scrapbook night was in order! If you scrapbook solo, I highly recommend that you work with a friend or find a scrapbooking group and try to get together once a month. I know when I work by myself that time flies by and I always enjoy my crafting time, but I found it to be much more enjoyable – and not just because of the wine! My friend Amanda and I have known each other since the 4th grade (I won’t even tell you how many years that is, but when we found a pencil that she had from elementary school, we figured out how many years it’s been!! ), so there’s a lot of history in that friendship! Anyway, back to scrapbooking – I was teaching her some of the tricks that I have learned over the past couple of months. 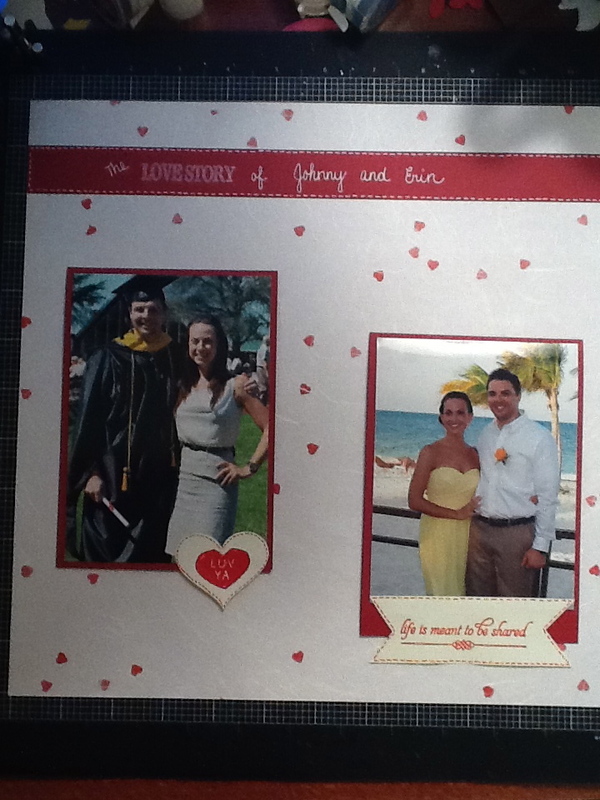 It’s easy to get stuck in a scrapbooking rut, especially if you do more than a couple of pages in one day/night. I wrote a blog on some ideas of how to get out of the rut, but that’s not what this post is about. I gave Amanda some tips and she said that I should write a blog about things that I’ve picked up that will maybe give others some new ideas for when they feel like all their pages look similar. And believe me, I definitely have days where mine do! So, here’s a tip that I found is helpful for before you even start scrapbooking. Once I get my pictures printed (which BTW – snapfish is doing a 99 prints for $.99 sale right now – best time to buy prints!! ), I put them in order. I’m a scrapbooker that likes to (try to) keep the book in chronological order. Since I’ve been doing so many other side projects, when I finally get a chance to scrap my pictures, I may not remember what happened when. I usually keep them in the envelope that they come in once they’re in order, but I saw something at Amanda’s house that I liked better. She got these plastic picture containers (from The Container Store I believe) and she keeps hers in there. That way dust and dirt (or wine!) can’t get to them. After my pictures are in order, I eventually pick a scrapbook for them to go into. Once I’ve picked the book, I start dividing the pictures up into how many I want on a page and then place them in the sheet protector. I also choose the background paper that I want to put with the picture. The reason for this was, when I first started I didn’t do that. I would work on one page at a time and then I would get to a certain page and say, oh, that background I used would have looked better with this set of pictures. I tend to be a perfectionist in some respects (eyeballing it Amanda?? Really??? lol) and I don’t like when I think I could’ve used my paper better. This works for me, I don’t know if it will work for you. Also with this, you can make sure your pages that are next to each other coordinate, if that’s the style you are looking for. Now that you have divided up your pictures and are starting to work on your pages, my second tip is about multiple pictures on a page. Often we will have some of the same pictures, just at different angles or with one subtle difference in them and we want to include all of them on the same page. So, how do you get 5 or more pictures on the page without cropping them? Simple – mats that open!! This was a trick that I taught Amanda and she loved it! She was working on her daughter’s first trip to Disney and was scrapping the Character Breakfast. She had a bunch of pictures of her with the characters and I thought this would be a good way to show her how to do this neat trick I learned. First you take either 3 landscape or 3 portrait pictures and determine how much of a mat you want them to have. We decided on 1/4″, so I had her cut the mat to 6 1/4″ by 8 1/2″. NO EYEBALLING AMANDA!! Then I told her to score the 8 1/2″ side of the paper at 4 1/4″. We then folded it and attached a ribbon to the middle of the left side of the paper when it was open. This will allow you to easily open and close the picture mat. She then took the three portrait pictures she picked and attached them to the three sides of the paper, leaving the back blank so that she could attach it to her background paper. She did the same thing for the landscape pictures. There was a single picture left over and so we matted that one so it looked similar to the other two sets of pictures and then glued it to the background. This technique works best when you have one event and multiple pictures, or even one theme and multiple pictures. Recently I did this for my brother and future sister-in-law’s album and I did it for shots of the cousins over a couple of Christmases. The good thing about it is if there’s a picture that you like and tells part of the story but it’s not perfect, you can still include it by having it “hide” in the inside pages. 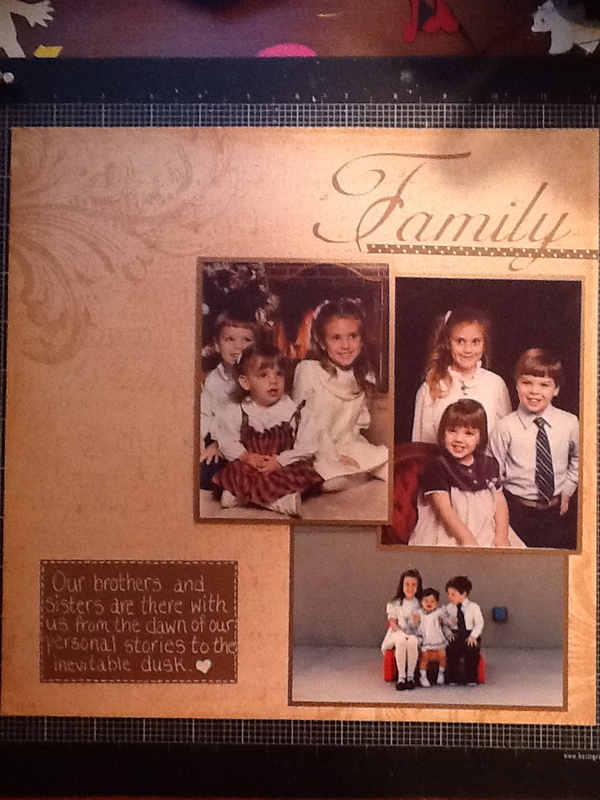 Here’s an example of how it looked for the book that I made for my brother and sister in law. Instead of using ribbon to open them, I used a heart punch and a scrap piece of paper to create a banner. My third tip is how to mat two pictures that are so similar. Say you have two pictures of almost the same thing – it happens a lot to me now that you can do rapid shots with digital cameras! You love both of them and they catch basically the same moment and you can’t choose between the two of them. What are you to do? Use them both!! For my brother’s album, I did just that with his birthday pictures. There were two pictures of him blowing out his candles and I wanted to use both of them. I put them over and under (you can also do side by side) and matted them. Usually I’d mat each one individually, but this makes it look like one big picture in sequential order. My last tip is for using multiple pictures of the same subjects, just at different times. I had two professional photos and one candid shot of my brother, sister and myself that I wanted to include in one layout. I wanted them to be in a cluster under the word Family (that was part of the background paper), but I wasn’t sure what to do. I matted them on shiny brown card stock and played around with the positioning on the background paper. When I was playing around, I realized that I should layer them! I had bought some shaped foam board cut outs awhile ago from the dollar bin at Target. There’s lots of excess around the shapes, so I cut that off and made foam tape layers. I adhered the bottom picture right to the background, the picture on the right with one layer of foam and the left picture with two layers. It gave the page dimension and I thought it came out well! Hope these tips are helpful when you are looking for some new techniques. Sometimes all it takes is a little bit of moving pictures or embellishments around on the page to come up with a new idea! Please feel free to leave a comment. Thanks for stopping by! Posted in ideas, scrapbook tips, starting a project and tagged attaching multiple pictures to a layout, getting out of a scrapbook rut, layering pictures, layouts with similar pictures, matting techniques, Scrapbook ideas, scrapbook techniques. Bookmark the permalink. Tired of not being able to find an image on your Cricut cartridge? If you’ve read any of my previous posts, you’ll know that I have a paper problem. Well, now I have a new problem – The Cricut. No, not the insect, the machine. I have way too many cartridges and I can’t always find the image I am looking for when I need it. I know what I want, but I can never remember which cartridge contains that image. Very frustrating! A couple of months ago, I came up with what I thought was a good idea. I decided to make my own directory of all images and phrases. I started with one cartridge and it took so long to complete, all I did was that one cartridge. So, that really didn’t help at all. It was back to me flipping through all the booklets to find that one image! Until yesterday. I was watching some videos on Christmas cards while I was working on my rather large, special project (pictures and more to come later! : ) ) and came across this woman whose videos I love! She makes the cutest cards and has some great ideas. At the end of one video, I got the solution I had been waiting for – there’s a website where you can search for an image or phrase! I went to the site and it does really work. The site is http://www.mycutsearch.com. It’s fantastic! I wanted to see if some keywords that I wanted to cut out were in any of the cartridges that I had. You plug in a word and all the images or phrases associated with that word comes up with the name of the cartridge and a picture of the page where you can find it! There are a few caveats though. It works best if you use the singular form of the word you are looking for. For example, don’t use circles – type in circle. Also, use a single word and not a phrase. You will get more results back. I am sure that there are more, but these are the ones I have experienced so far. I am so glad that I saw that video, so thank you Mary from CardzTV. If you are ever looking for inspiration for a card, check out her adorable cards on YouTube. Hope this website helps you as much as I know it’s going to help me. Thanks for stopping by! Feel free to leave a comment, especially if you have any other Cricut cartridge tips! Posted in card making, Cricut, ideas, scrapbook tips, starting a project, YouTube and tagged cartridge, Cricut, directory, how to find a cricut cartridge image, image search, Mary CardzTV, YouTube. Bookmark the permalink. As I’ve said before, I have a paper problem. And, yes, admitting it is the first step. I think the next is doing something about it. For me, that clearly means buying more paper. I know, I know – I’m supposed to be trying to kick the habit, but how can you resist a good paper sale?? But back to my original point – with all the paper I have, sometimes I still don’t have exactly what I am looking for. It could be that there are no patterns that match the look I am trying to achieve or the color just isn’t the right shade that I need. This happened to me when I was creating a layout for my goddaughter’s album. I saw a sketch of a page layout that I liked and decided that this page would be the perfect one for me to try it out on. The page only had one picture and I wanted something really cool for the background. 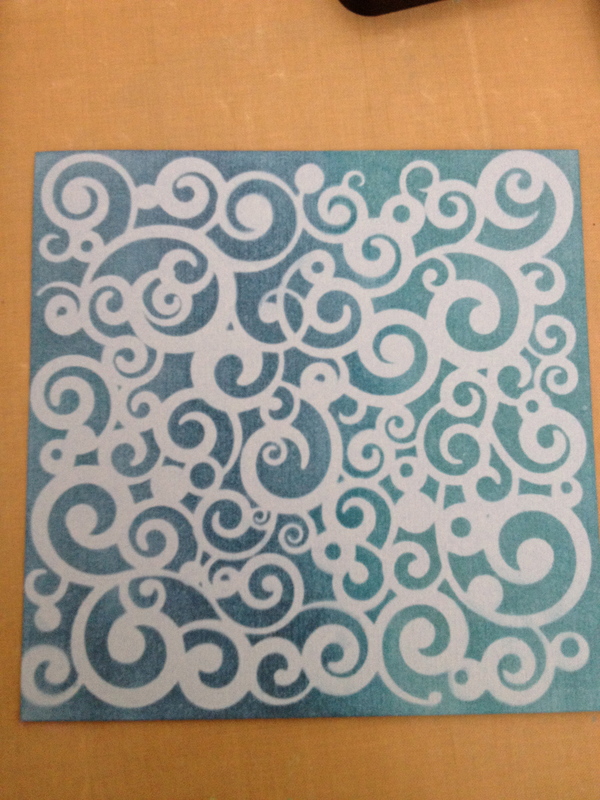 I started off by choosing the background paper – a white page with two different color blue designs. 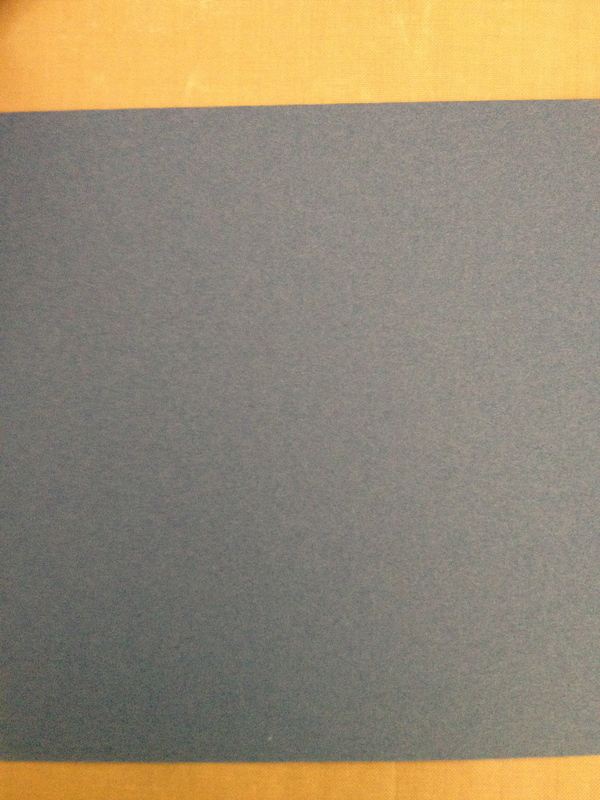 The I looked through my (overstuffed) blue paper pack and chose three colors that I thought would coordinate well with it. I picked two solids and one pattern. 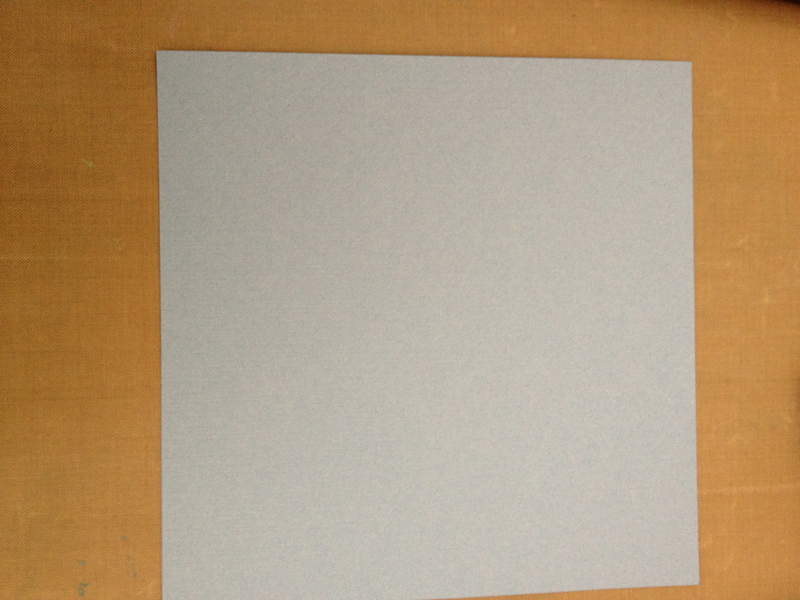 I cut the three sheets into 6×6 squares and placed them on the page. The two solid pages looked too plain next to the polka dot one, so I decided to alter them. As hard as I tried to find three patterned papers that would go together, I couldn’t seem to find any that I thought would look good with the background. I have a hard time with this – especially when I see the papers that others choose when they start their project. I often think – how do those patterns go together??? So, instead of trying to match patterns and color, I matched the colors and then decided to create my own patterns. 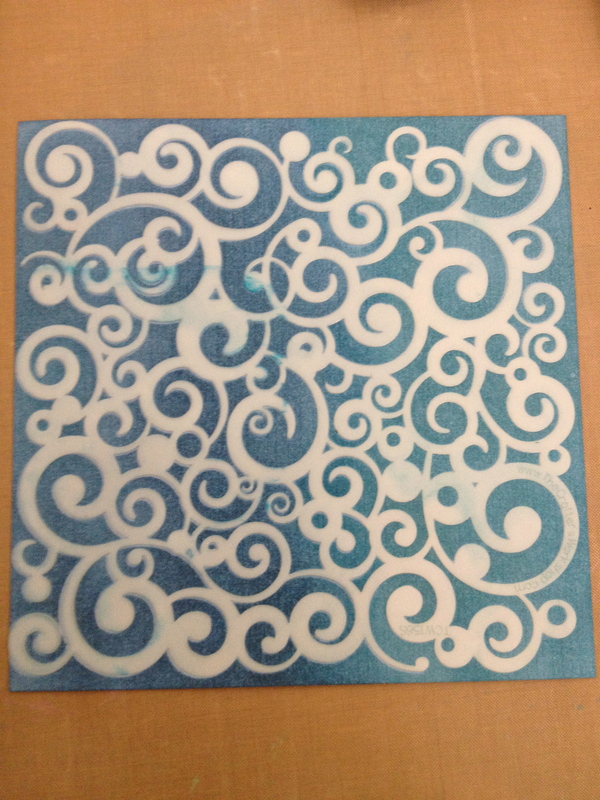 For the first sheet, I used a swirl stencil. 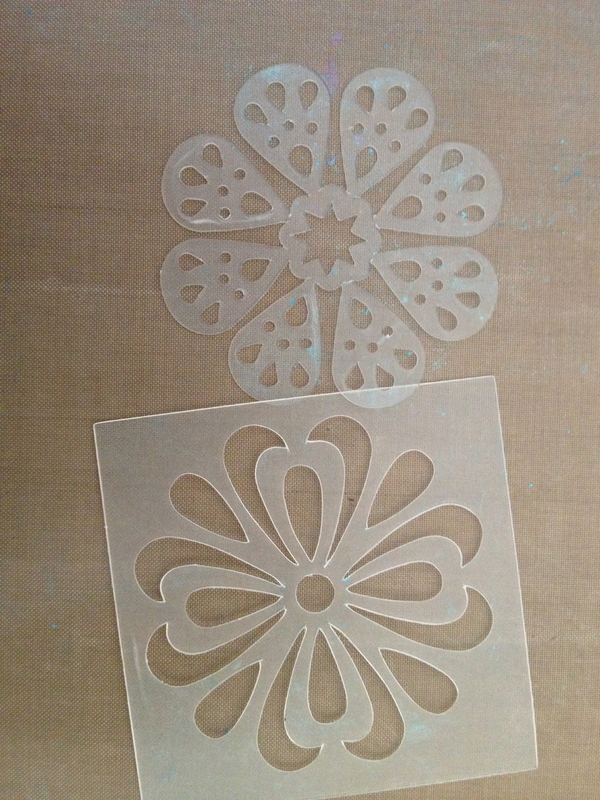 I haven’t used stencils much in the past, so I thought this would be a good time to try. If it didn’t come out good, I had three more shots with the rest of the 12×12 paper! HA. 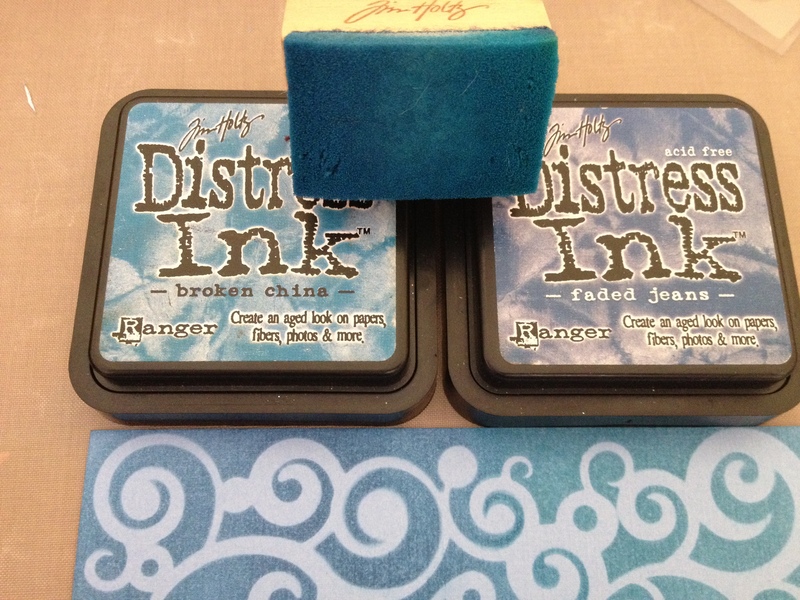 Since the background features two different color blues, I chose the two blue distress inks I have – faded jeans and broken china. At one end I started with one color and worked my way about halfway down. Then I started at the other end with the other color. Once everything but the middle was done, I took my blending tool and dipped one end in one color and the other in the remaining color and just started blending. I removed the stencil and I had such a cool design! When all else fails and you can’t find the right paper for your layout, make it! Whether its using markers, paint, distress inks, stencils or stamps, you can easily make whatever you need to go along with the project. 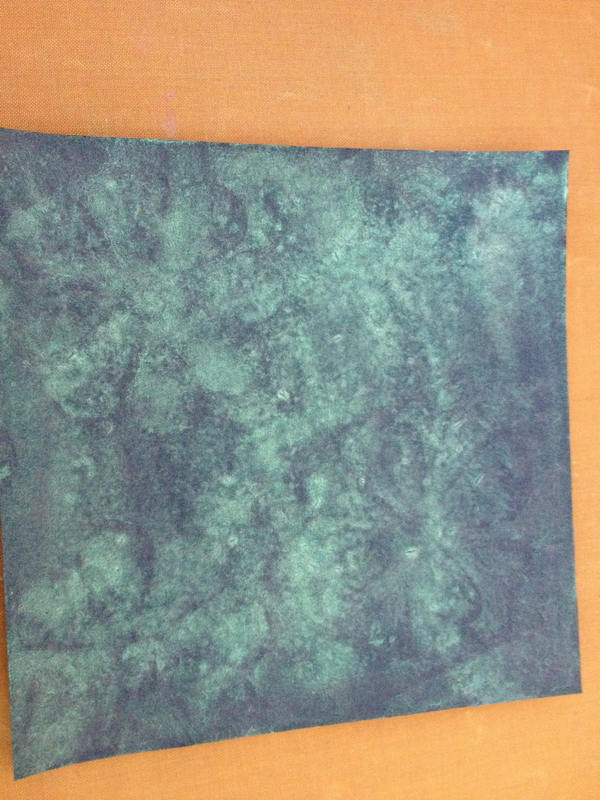 Making background or accent papers gives the project a real homemade feel. Thanks for stopping by! Feel free to leave a comment or question. 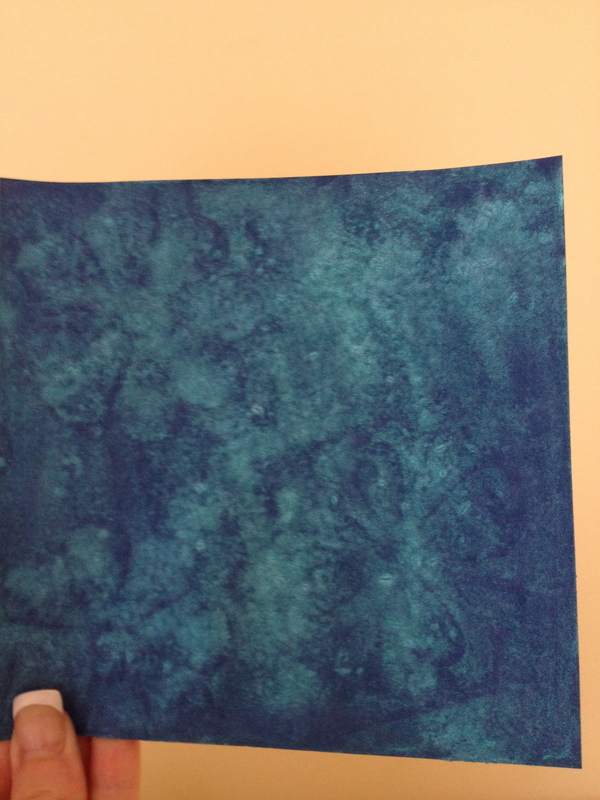 Posted in distress ink, ideas, scrapbook tips, Uncategorized and tagged distress ink, making your own paper, paper, Perfect Pearls Mist, scrapbook idea, scrapbook page, spray, stencil, Tim Holtz. Bookmark the permalink. Posted in ideas, scrapbook tips and tagged acreativeneed, blog feature, Etsy. Bookmark the permalink. I was thinking about where I get some of my ideas for projects for. Some come from the little books that come with the Cricut cartridge and then I design my pages around whatever image I am creating. Others come from the photograph itself or a certain background paper. I also use YouTube for some inspiration – type in a specific category that you are looking for and sometimes 40 or 50 videos will appear! But recently my source of inspiration has been a little different. Awhile ago I signed up for Pinterest and began to pin a few things – a Scrapbook Wish List board, a Dream House Board, an If I ever learn to cook, I’ll make this board [if you check mine Pinterest site out, you will notice that this board only has one pin. I don’t ever really plan on learning to cook : ) ]. But recently, I started pinning some items that have turned out to be sources of inspiration. Like I have said in previous posts, it’s very easy to get stuck in a creativity rut. Especially when you have a ton of projects going on like I do right now. Some have deadlines in the next month or so and others are a few months off. When I start to think of all of the things I need to accomplish, I get overwhelmed and the creative part of my brain shuts down. So, just spending 10 or 15 minutes on Pinterest can give me some new ideas and help me get back on track. But, who am I kidding? Like I only spend 10 or 15 minutes on there? So, maybe more like an hour! I get wrapped up in things – I get creative ADD! HAHA. In all honesty, I have found the site to be very inspirational. I don’t want to copy other’s work, but sometimes I see a new technique or product that I’d like to try. If you haven’t signed up for Pinterest, I’d say give it a try! We even got my mom to sign up and I taught her how to pin things the other day. It’s great for party planning ideas – especially for weddings. You can easily show bridesmaids a variety of dresses without having to send emails (no attachments to open up!!) or see what flowers would go best with your table linens or centerpieces. The possibilities for Pinterest boards are endless. I love to see what people have pinned! Posted in Cricut, ideas, scrapbook tips, starting a project, YouTube and tagged boards, creative, creative block, creative rut, decorations, ideas, inspiration, pin, Pinterest, weddings, YouTube. Bookmark the permalink. One of the biggest challenges that I thought I was going to face with the craft show was if I was going to be able to accept credit cards. The other night, I was talking to my best friend and her husband and he suggested that I get one of those readers that hook onto your iPhone. Today I just happen to catch a commercial for Square. It’s a card reader that can hook into an iPhone, iPad or Android phone. If you go to their website, Squareup.com, you can watch the video and it explains how the machine works. The best part is that you don’t get charged a monthly or yearly fee. They charge you 2.75% of the purchase price if you swipe the card and 3.5% plus $.15 per transaction if you manually enter the card. I thought that I discovered something new. I posted this information on some of the community boards in Etsy and apparently I’m late to the party. : ) But, I did get a couple of good responses from people who have used the reader. Everyone was raving about it. It’s cheaper than Etsy (they charge $.20 to list an item and then 3.5% of the total transaction) and so convenient. One of the coolest features of the card reader is called Square register for the iPad. You can take pictures of your items and include pricing so that when your customer purchases that item, all the pertinent information is already there! You can also keep track of your regular customers and have them check out by name or offer them “loyalty discounts”. There are videos to show how vendors are using the products and how easy it is to use! Once I actually get the reader and can use it, I’ll write a post reviewing it. If anyone has used it and has any tips or advice, please leave a comment. I’m curious to see what everyone thinks! Posted in ideas, scrapbook tips, Uncategorized and tagged craft fair, credit card, Etsy, iPad, iPhone, payment, Squareup.com, transaction fees. Bookmark the permalink.